This weekend I returned to my native land of Toronto to visit family and timed the visit with the Toronto International Boat Show, Canada's largest. I snapped a few pictures that might be of interest to other Jalops, but really there's so much to see it's hard to distill. I'm a big fan of the Four Winns brand, as my family runs a 17ft bowrider and I really like their high quality manufacturing and excellent value. The models have come a very long way since we bought 8 years ago, with prices moving accordingly, but this H180SS powered by a 4.3L Volvo Penta would be a rocketship on the water. Someday I will have one. 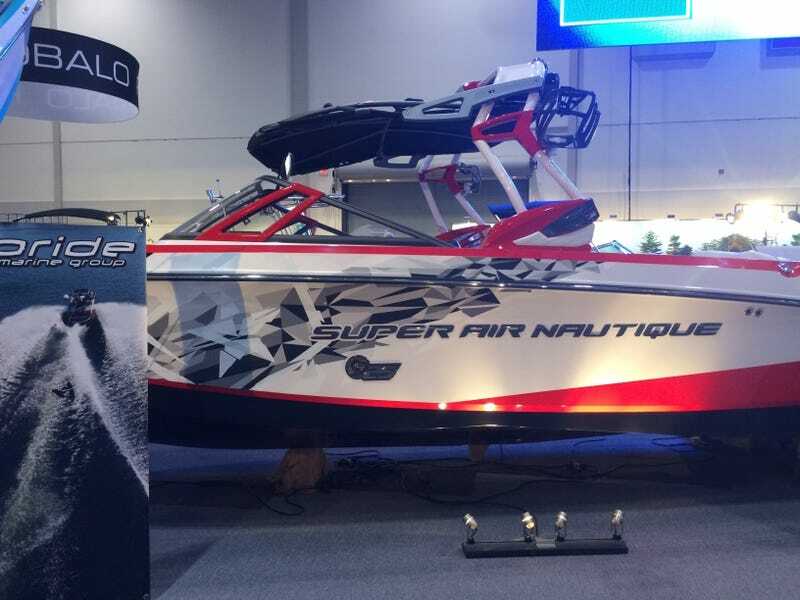 Luxury on the water is very well represented, like this Air Nautique wakeboard boat shown up top. Most are powered by big V8s and have so many toys, Xzibit would feel right at home. Most marine inboard/outboard engines are automotive blocks supplied by GM that are bored or stroked for marine use. Many related components are automotive derived as well. One of the most popular configurations is the 4.3L V6 that produces between 190-220 hp but Mercury Marine decided to shift the market by designing and manufacturing their own 4.5L V6 top to bottom to better optimize power for marine use. This one produces 250 hp and will fit in any application that uses the 4.3L. Mercury had a lot of racing engines on display and this sweet twin turbo setup was nicely cut away to show the different components. I didn't see exactly what the engine specs are but 2000+ hp isn't out of the question. This was also in the Mercury stand, presumably to demonstrate how well their engines can be used for different purposes. It can even kick in on the water! Bonus super clean Defender I saw on the walk in.